Hello and welcome to July's edition of Runners Tell All. Runners Tell All is a monthly linkup hosted by Sunshine to the Square Inch and The Lady Okie that occurs on the 21st of every month. Our goal is to build a community where we can encourage and inspire each other on our running journeys. Each month we offer two co-host options. This allows for us to connect with you, advertise your blog and it also helps fund the monthly giveaways. If you are interested in sponsoring the RTA you can do that over on my advertising page. July's prompt is running and nutrition. What fuels you to run best? Next month's theme is either your favorite person to train / run with or your favorite training plan. We know not everyone is a social runner so we had two options for you! Sponsorship Update: I put the ad spot for Runners Tell All on my advertising page. I have the $15 option listed but if you want the $10 option just let me know and I'll give you a coupon code for that. Bananas & Peanut Butter - Let's just get something straight. I don't like either of those things and if I had to snarf them down at 5am for a race let's just say that wouldn't be pretty. My running food is just really different than most runners but it works for me! What do I eat? Bacon, sausage, eggs, and potatoes! I know. I'm a rare one out there. Let me do some explaining. For some reasons, carbs don't sit well with me. I've done the banana, bagel, peanut butter thing and it really does make me want to up chuck. For some odd reason protein sits really well with me. It doesn't bother my stomach and I feel like the fuel lasts a lot longer. After every big race I have a HUGE post breakfast (see picture above). Now, I'm about to share some super weird food stories so come and read along. Oh, and if you are a vegetarian you probably won't love my love for meat. Post marathon in Seattle - I went to a Brazilian steakhouse. If you haven't been to one they have a MASSIVE salad bar and then come by your table with skewers of meat and cut some off for you right there. They have around 10 options of meat. Well apparently marathons make me hungry because I had 4 plates of meat. *kind of embarassing* but I was hungry! Pre-running McDonalds - BAD IDEA GUYS! Just don't do it. I had a 10k race and I didn't prep any food. I thought "What harm could a sausage muffin do?" oh my friends, it does harm! The heat was unusually hot that day and McDonalds + heat don't mix well. Don't worry though. After the race I still had my 'meat me breakfast'. Ain't no McD's stopping me from that! OKC Marathon Relay - I had never done a relay before and I got to my spot super early. I knew by the time my running partner arrived I'd be famished. I turned and 'WALAAAAA!' There was a Whole Foods right there! Well, I just walked my little self right over and ate me a bowl of eggs and potatoes. I had enough time to digest my food and enough fuel to last me for a 10k. Below is my post race food picture after the Rock'n'Roll Chicago 1/2 marathon. I was a happy girl. For the longest time I had bad stomach issues. Think "Where is the next porter potty emergency?" kind of stomach issues. I finally read somewhere that many runners take their GU & drink gatorades on the stops. They said to either only eat GU & drink water or to drink gatorade & water. Drinking both Gatorade & eating GU is too much sugar intake for your spleen and you will get the big runners dreaded "D"! Post Race Replenishment - After long runs you lose a lot of salt. For the longest time I couldn't figure out why I felt ill for hours on end. Finally, my friend told me to eat some salt! I had completely forgot about salt. So, what did I do? I went and had some street, carne asada, tacos! It did the trick and I felt great. What's your go to nutrition? Any one else out there thrive off of protein rather than carbs? Today we are giving away the perfect gift that goes along with nutrition - a RunnerBox! 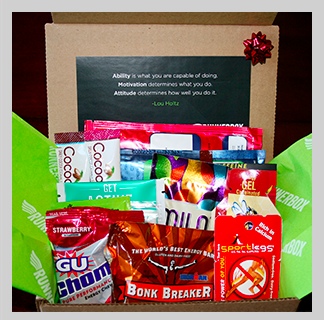 The RunnerBox comes packed with food to fuel you for some serious running. The RunnerBox also has a gluten free option so if you win & are gluten free be sure to tell us. This giveaway is open internationally BUT RunnerBox only ships in the United States. Therefore, if you win we will work to send you a gift card or the cash equivalent of the RunnerBox. As always -entries will be verified so please be sure to play by the rules. 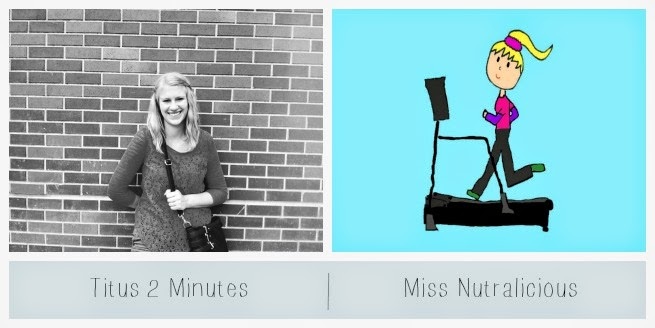 A big welcome to Titus 2 Minutes and Miss Nutralicious! We are so thankful to have you both as sponsors this month! 1. You must leave a comment on the person's blog who linked up directly before you. This linkup is to build community by reading, commenting and encouraging one another. 2. Only link up the posts related to the running prompt. Unrelated link or links directly to your homepage will be deleted. 3. Please link back to either Beka and Amanda in your posts or use the button below. The more we have join in the merrier! You don't like peanut butter? It was the motive behind my latest post and you could say I'm a little bit a addicted, haha. But that's really funny about your OKC marathon relay story! I could totally see myself doing that too! Thanks for hosting!! Oh my goodness, you must have a stomach of STEEL!! Ah! So much food before a race - I couldn't do it! I would probably be done before the race even started. Now, the night before that sounds like a perfect meal! I am a protein eater! I don't eat much before a run, but definitely feel like I need more protein than carbs on a daily basis to run well. After a run I always want a huge cheeseburger. Always! Thanks for hosting the link-up again this month! Eggs do it for me, too! I have stuck to bagels or toast in the past because it's the norm, but I've recently noticed how much stronger I feel when I eat an egg breakfast so I think I'm gonna start that for races and long runs. Eggs are yummy!!!! Nutrition is SO important!! I remember my last tri, when I went to the info session they said the worst thing you can do is 'carb' up the night before! I have to admit I love the banana and peanut butter thing! 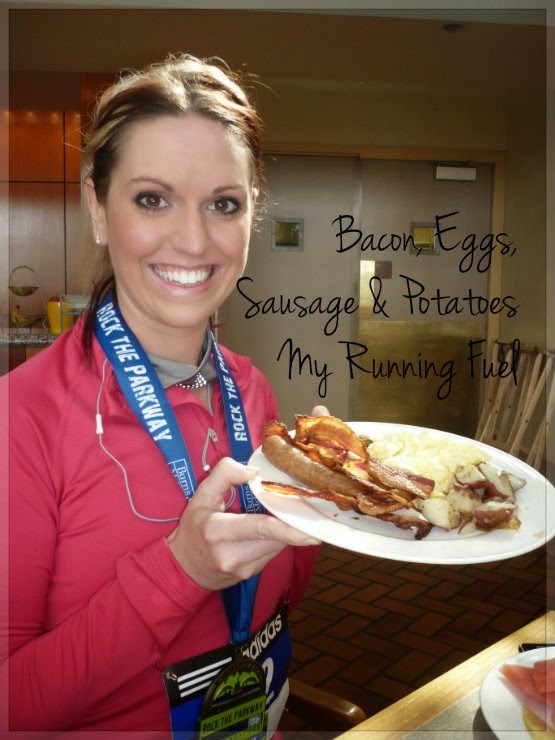 But those eggs and bacon look delicious too, and sounds great for a post race meal! I remember Chicago and the huge brunch we ate afterwards! Nom nom! I also remember in Seattle that 4 days later is when you had the huge Brazilian feast, and you and I were still starved! Well, I think we were famished because of the hills! We should of had a plate of meal per hill we ran. ba ha ha ha! Well, I do like Justin's Chocolate Hazelnut Peanut Butter. Does that count? I can eat pb every now and then but big spoonfuls before a race? Can't do it! Thanks for stopping by and dropping me a comment. I love this linkup and enjoy it every month! We sure do forget about salt! I seriously can't function and then the 'salt light bulb' goes off in my head. I know the meat thing goes against science and nutrition but I just gotta have meat =). I don't know why I am that way but I am. Sometimes they serve hamburgers post 1/2 and full marathons and that is super exciting for me! I guess I do have a stomach of steel. =) I have never thought of it that way but it's true. I grew up in Brazil eating a lot of meat so I wonder if that has something to do with it. Yeah, girl, don't do the McDonald's. It was the worst. I'm glad to hear someone else doesn't love pb and bananas. Just not my thing! I know! Your post is so opposite of mine! It's so weird how bodies react differently. I have no idea how my body functions with meat but somehow it does. I'm so glad someone else understands that. I have one friend who said she goes to Chipotle the night before a big race and I think that makes a lot of sense. YES TO THE CHEESEBURGER! I love that some races have cheeseburgers after. It's just epic! Thanks for commenting and joining in on the linkup! You all make it awesome! Yes to eggs! I eat eggs all the time and I do think they are super good for running. They have protein but aren't too heavy on the stomach. I wonder why they said carbing up is bad? Maybe just too much to process? I have never felt well when I carb up. I think part of it is because you have to wake up so early for a race that I don't even feel like my huge pasta dinner is digested from the night before. I'm glad you love it! So many people do and it works great for them. I'm just not one of them but that is ok! I could go for your eggs, bacon, and potatoes after my race, but I think they'd kill my stomach before a race. My go to pre-race fuel... banana and peanut butter. Isn't it funny how we all tolerate foods so differently? Wow, good for you actually figure out what your stomach can and can't handle! I strongly believe that when it comes to working out, running, nutrition, etc. there's no one-size-fits-all, so just because Runner's World or whatever says to do XYZ, if it doesn't work for you...don't do it. I have read lots of running articles and then I just glean the information from there that will work for me and leave the rest. I do think it is so interesting that with all the science and knowledge out there that everyone works so differntly with different foods. I know! Isn't it gross?! I even ate a big steak once and then hopped on a treadmill and ran a 10k. ha ha! I have no idea why my body handles meat over carbs but it just does for some odd reason. Bannerizer made it easy for you to promote ClickBank products with banners, simply go to Bannerizer, and grab the banner codes for your favorite ClickBank products or use the Universal ClickBank Banner Rotator to promote all of the ClickBank products.